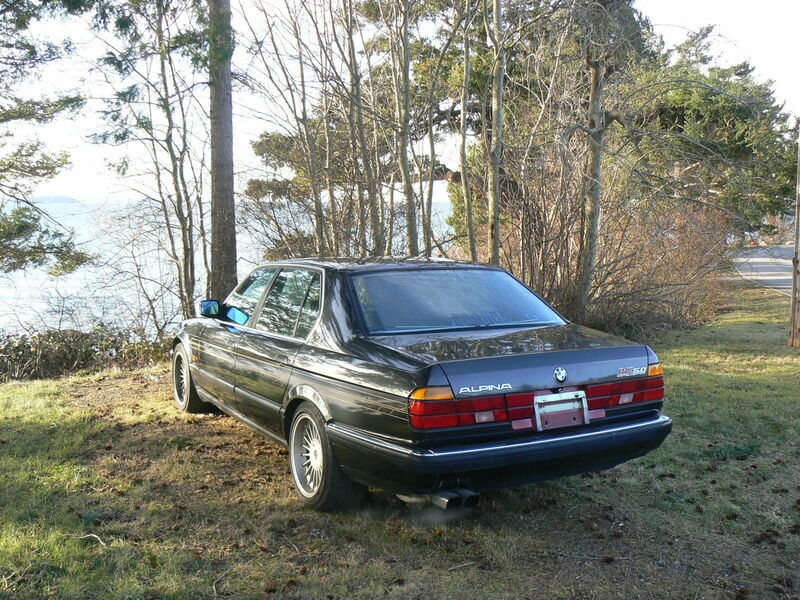 Such was the depth of BMW’s great designs from the 1980s that often the E32 is overlooked. Unlike the E23 it replaced, the scaled-up Claus Luthe-inspired design really worked and the heavy-weight look of the 5-series in a fat suit was met with more aggression, yet still elegantly. 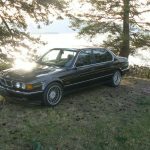 As you’d expect from a car intended to challenge the W126, BMW threw the kitchen sink at the 7-series, upping not only the technology, luxury and interior materials utilized in the E32, but the engine offerings, as well – the M70 and later M73 V12s beat Mercedes-Benz to the market with silky smooth and powerful twelve cylinder motors that were the trump card with the Trump types. Yet while popular and well built, finding good examples of especially early 7s has become quite difficult. Today we have two interesting examples to consider. Both are far from original, though each in their own way is compelling. For those who like subtle speed, there’s a M70-powered, low mileage 750iL Alpina B12 5.0 clone from Japan. If you’re a little more in-your-face and like to row your own, there’s a Racing Dynamics-inspired 735i 5-speed. Which would you choose? NO RESERVE BEYOND THE START PRICE! BID WELL AND DRIVE IT HOME! 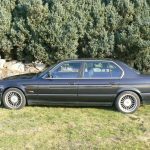 This unique 7-Series is a Euro-spec car that went to Japan when new (production date is 02/1988). 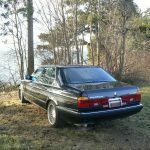 Sometime after it arrived in Japan, it was fitted with all the rare Alpina options that were unavailable here in the US: steering wheel, seats, door panels, wheels, front valance, badges and decals. 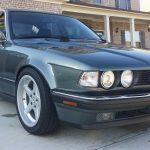 Itâ€™s not known whether any of the Alpina engine or transmission mods were done, but it’s hard to imagine an enthusiast stopping at the cosmetic items. A Euro-spec model, this vehicle is left-hand drive with the speedometer reading in Kilometers and other instruments and controls reading in Celsius. Euro elevating projector headlights with front and rear fog lights, M70 5.0L V12 engine, automatic transmission, power windows and door locks, sunroof, power front and rear seats, A/C, cruise control, and sunroof. This vehicle was sourced from a private collector in Japan, who had stored it in a garage for a number of years. The mileage is exceptionally low for the year and overall the vehicle is in excellent condition. 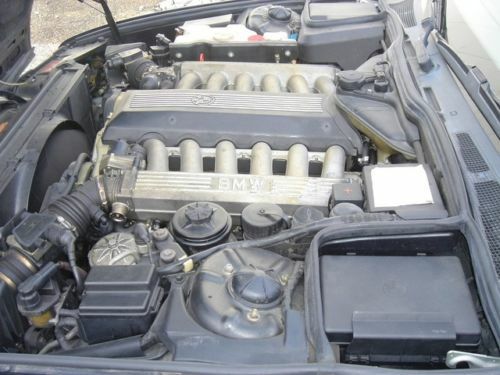 Mechanically this car is in great shape; the engine starts right up and idles smoothly. It runs cool, with the temperature gauge staying just below the twelve oâ€™clock position. The driving experience is exceptional, the engine pulls great and puts power down smoothly, and the automatic transmission upshifts and downshifts firmly. Steering is tight; the car tracks straight with no wobbles or vibration. 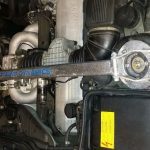 The brake master cylinder has been recently replaced and the brake booster rebuilt; the brakes stop the car quickly with no pulling or pulsation. 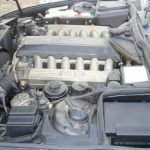 The engine has the usual V12 upper pan gasket oil leaks that youâ€™ll want to address eventually. One of the fuel pumps just started dropping out intermittently, easy fix on these cars. There are no doubt other minor issues to be dealt with that havenâ€™t revealed themselves yet; these are complicated cars that reward dedicated maintenance and attention with a superb driving experience, and punish neglect accordingly. Buy it for the long haul and enjoy the ride. Cosmetically the vehicle presents very well; the body is straight and completely dent free, the paint is shiny and in remarkable condition for being almost thirty years old. Thereâ€™s a trivial ding on the hood and the expected little sand blems on the leading edges, a little parking-lot rash on the right rear bumper cover. The Alpina leather interior is in immaculate condition with no rips, tears or wear, the wood trim is in great shape, all controls work as intended. The factory radio has been replaced with a Japanese aftermarket head unit and a navigation system for Japan has also been fitted. The only interior defect is the sagging headliner which has been poorly glued back into place in the rear. S489 Lumbar support, passenger, electr. This vehicle has been correctly and legally imported into the US from Japan; all the necessary documentation to register the vehicle anywhere is present and in order. A US registration will be provided, which can be transferred to any state. California buyers can obtain CARB certification through G&K Motors in Santa Ana. Call 360 356 1154 with any questions or concerns on regulatory issues. Additional photos on request; simply contact via ebay email. The vehicle is located near Bellingham Washington and delivery within 500 miles is available for a reasonable fee. Shipping can be arranged to anywhere in the world at buyer’s expense. Sold as-is where-is with no warranty express or implied. Call 360 356 1154 with any questions. Car is also being proferred in other venues and this listing can be terminated at any time. 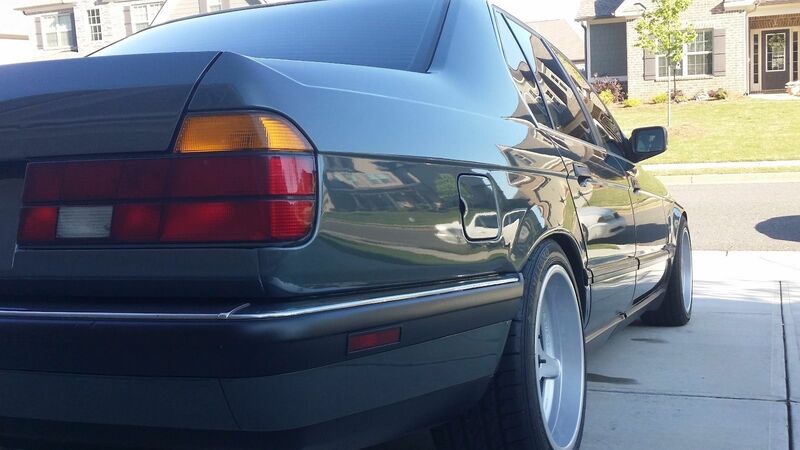 Before we go any farther, this is an impressive 750iL. The condition I think doesn’t show particularly well in the seller’s photographs – however, it’s very low mileage and has all the look of the Alpina B12. 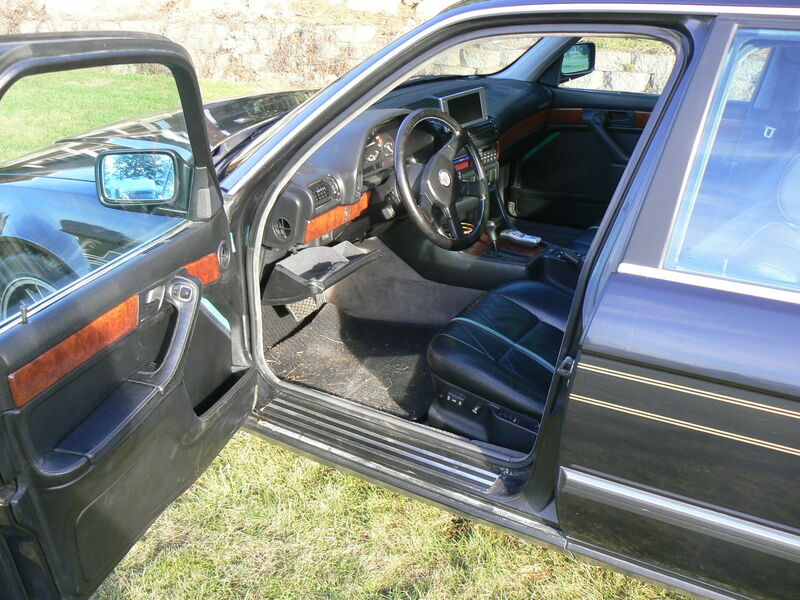 The wheels, body kit, badging, and even the interior are all faithful recreations of the real B12 and appear to be correct parts rather that replicas. The engine shot seems to indicate that it does not have the upgraded power unit, nor does the exhaust look different than stock. Does that matter? Not really, since it’s not original anyway. But what’s really great about this auction, if you don’t mind the lack of authenticity and originality, is that it’s no reserve – and, currently, under $5,000. This is a very rare car. Only about 240 735i 5spd cars were imported to the US. COMPLETELY RESTORED! The cool factor of this car is off the charts. I get thumbs up and compliments every time i drive it. All upgrades are time period correct and i have about $15,000 in receipts in a folder. New paint, top end engine rebuilt and Turner Motorsport chip installed (43hp & 28lbs torque), AC System redone and ice cold, cooling system overhauled and water pump, belts and hoses done. All suspension bushings and control arms, Ground Control coilovers w/bilsteins, RARE Racing Dynamics wheels 17x8fr 17x10r, Racing Dynamics strut bar, 6000k HID euro smiley headlights. Lots of extras such as Racing Dynamics steering wheel from Italy(VERY RARE), lighted shift knob, Z4M short shift kit, replaced leather on drivers seat bottom, ALL dash vent actuators are brand new (VERY labor intensive). Killer stereo with Focal 5.25″ speakers in stock speaker spots and Kicker SoloBaric L7 sub (sounds wonderful). Full original tool kit. ALL VIN STICKERS IN PLACE ON ALL PANELS. CA car. Never wrecked! Extended leather center console and door panels from 735il. ZERO FLUID LEAKS!!! 1. Steering box has quite a bit of play(about 14 degrees). Tried adjusting but no luck. (reman unit on ebay for $292). Causes car to “wander” and slight wobble. 2. Headliner is fine but the sunroof switch panel is done in a darker gray. 3. 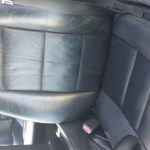 Sunroof seal needs replaced (I just order the $80 part and will replace it). Doesnt leak but does have wind noise. 4. Paint isnt perfect. A couple very small bubble spots at the very bottom of the drivers side fender where it meets the door. Racing Dynamics was the hot new alternative to the traditional Hartge and Alpina crew in teh late 1980s and early 1990s, and while they never quite caught on in the same way the pieces are always nice to see. They were high quality pieces that were full of nice detail work even if the logo did rip-off Alpina’s signature colors slightly. This 735i has a bunch going for it; the 5-speed is obviously the big draw in the big chassis, but the wheels inside and out are nice additions. The color combination in Delphin over Schwarz is nice and the outside features a respray. 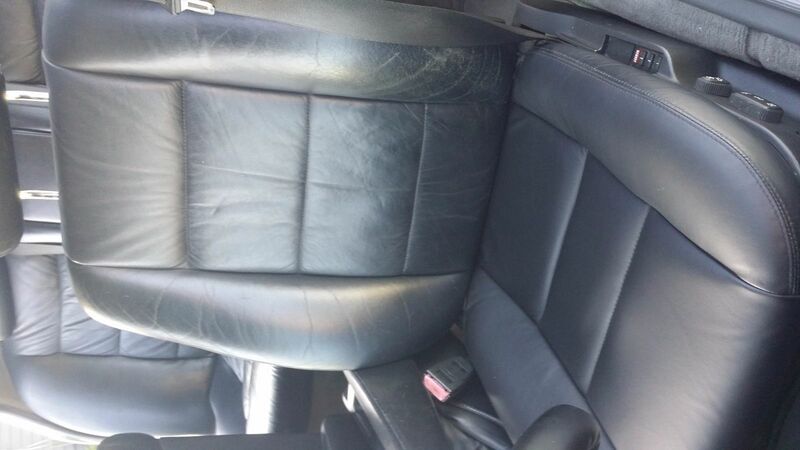 Inside the leather shows some wear and it’s unfortunate that the seller hasn’t gone a step farther in replacement of materials; the half-recovered driver’s seat stands out, for example. 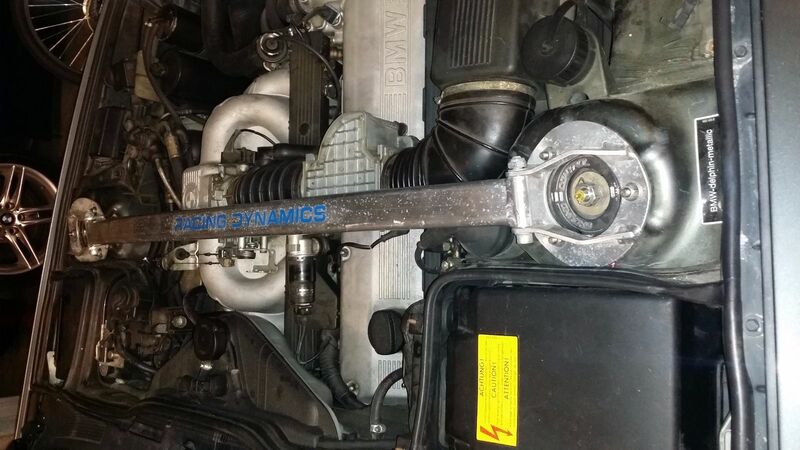 The mods have perhaps gone a step farther than some would like; I wonder, for example, what the ride quality is like on the very low (but quality) Ground Control coil-overs. This car is interesting as it was very early production (March 1987) and fairly lightly optioned. Miles are higher but unlike many well worn 5-speeds, this one still looks generally quite good even if it admittedly has a few needs. Which is the winner? Either will draw a crowd at a BMW show. The Alpina clone could easily be dressed up a few notches and really impress with the look and rarity of a clean V12 model. But the 5-speed is probably the more entertaining driver, and the scarcity of the manual models in the future in ensured. 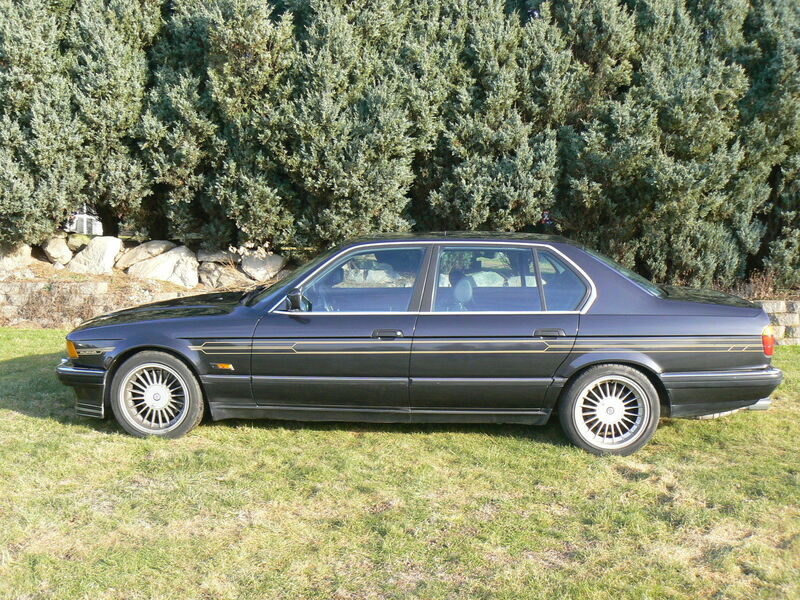 Either way, these E32s are short money for a lot of BMW style from the 1980s. 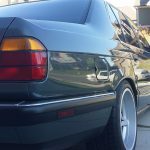 Tagged 1988, 5 speed, 735i, 750iL, Alpina, B12, BMW, E32, M30, Racing Dynamics, replica, V12. @Jonathan – the auction ended, but the car was unsold. It’s popped up a few times already so I’d bet it’ll be back. I’d also bet the seller is looking for at least $6,000 and probably more. I’ll post an update if it’s likely relisted. Love the Alpina looks. But would prefer it in a smaller engine and manual. Oh please, how naive. Lots of people are poseurs. Alpina wheels do not an Alpina make. He could have put those wheels on a Chevy Corsica. It’s an ebay, I mean free, country. 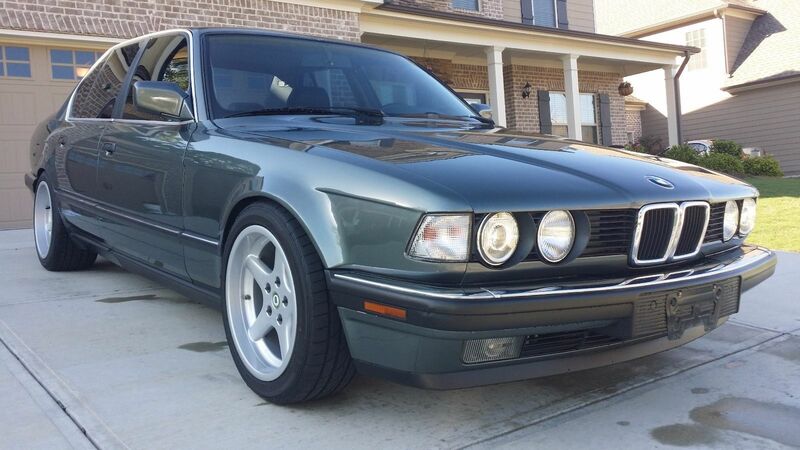 I contacted the seller on the Alpina…there is zero paperwork or service history. It would be a cool car, but quite expensive to put right if it hasn’t been maintained properly, and a quick $10k bill might sour the experience. I wouldn’t trust an undocumented/imported V12. Not much performance advantage and scary repair costs. Now, the 5spd inline six is another story. A real drivers car, that. Just get the annoying steering rack issue sorted. 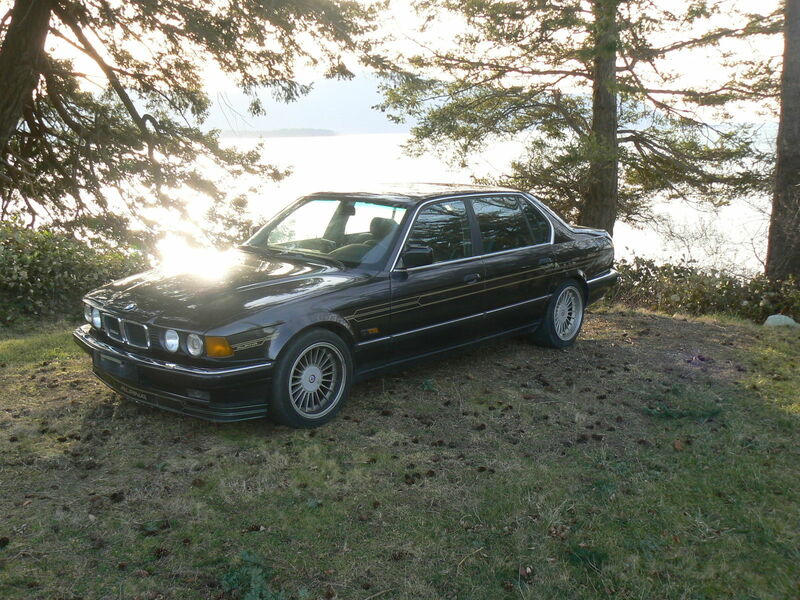 The 735 seems like a good buy even at $6k with the upgrades. @Carter – do you see these appreciating in value over the next 5 years? It seems like everything BMW related has gone up 25-50% over the last 5 years or so. @Jonathan – based on the E23, no, I doubt it. Mint examples will certainly have their appeal, but modded cars are only valuable to those who really like bargains and the mods. If you’re looking for a collectable early late 80s, early 90s BMW the E30 and E34 are still much better bets with wider appeal – especially in M form. The manual could be worth a mint if it was in perfect condition with lower miles, but it’ll cost you a lot to get it to be worth much more I think. They’re great values though if you just want a really nice driver’s car with a lot of luxury but that is still reasonably easy to service.